Today, Dr Leaf posted this on her social media feeds. It’s clearly meant to shock and enrage her followers. Dr Caroline Leaf is a communication pathologist and a self-titled cognitive neuroscientist. She’s also cast herself as an expert on mental health. To the detriment of her followers, and sadly, to the rest of the Christian church, most people believe her. Her most recent book, and her social media memes for the last couple of months, have made it clear that Dr Leaf is pursuing her own personal war on drugs … but prescription psychiatric drugs not the illicit kind. Unfortunately, her attacks on prescription psychiatric drugs have amounted to nothing more than a hysterically illogical smear campaign under the guise of her concern for public safety. Today’s offering follows the same pattern of narrow-minded hysteria. Whitaker, like Dr Leaf, is an outspoken critic of modern psychiatric treatment with a poor understanding of how psychiatric medications actually work. The statement that Dr Leaf quotes is remarkable for it’s poor logic. The quote implies that the rise in childhood mental health is because of the rise in psychotropic medication use in children. But correlation does not equal causation. Even if one in fifteen Americans enters adulthood with a ‘serious mental illness’, and twenty years ago our society began regularly prescribing psychiatric drugs to children and adolescents, there’s no evidence that the psychiatric medications are actually causing the psychiatric problems. The New York Times article that she linked to discusses the case of Andrew Rios, a child suffering from severe epilepsy, having his first seizure at 5 months. Though it’s clearly more complicated than just “simple” epilepsy – he’s pictured wearing a helmet which suggests that he has myoclonic epilepsy which is clearly uncontrolled. It’s also clear from the article that the child was having mood swings and violent behaviour before the anti-psychotic was given. The history of early seizures with ongoing poor control and violent behavior means that this unfortunate young boy likely has a severe and complicated neurological syndrome, quite possibly because of an underlying abnormality of his brain. And the symptoms he had which the mother claimed were from the antipsychotic were just as likely to have been night terrors, a common problem in two year olds. In the end, who really knows? But there’s certainly not enough in this article to clearly convict antipsychotics of being toxic or evil. Neither is the use of antipsychotics for infants widespread. 20,000 prescriptions for antipsychotic medications sounds like a travesty, but according to the article, the real numbers are probably much less, or about 10,000, since not every prescription is filled. Even 10,000 sounds like a lot, but that represents 0.0002% of all prescriptions in the US, and most of those scripts are not actually being taken by the child, but by their uninsured parent(s). So the prescribing of antipsychotics to infants is extremely rare, almost unheard of, and is only likely to be done in extreme cases where all other options have been exhausted. That’s certainly not the impression you get from Dr Leaf’s post, which is just another misinformed smear against anti-psychotic medications. 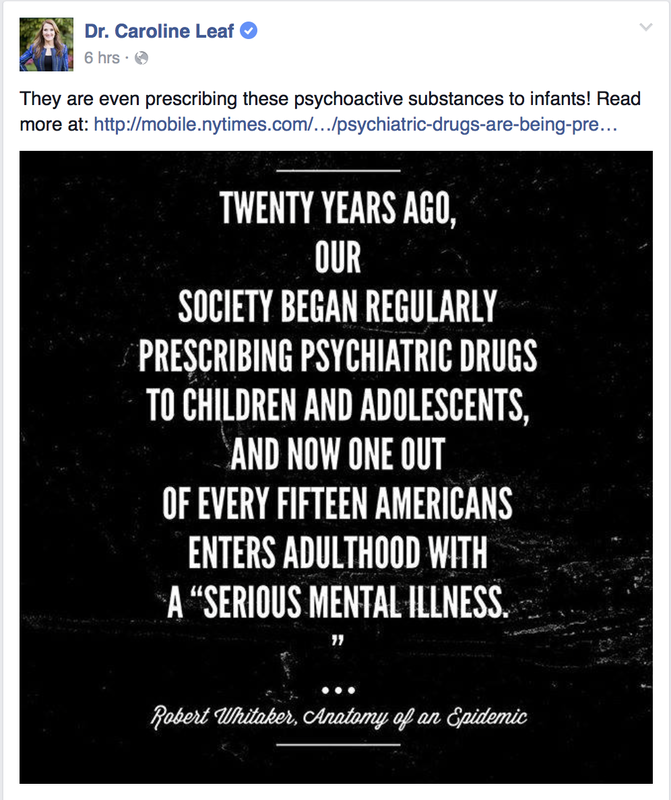 Dr Leaf’s war against psychiatric medications is reckless. When people who need psychiatric medications don’t take them, suffering increases, as do suicides. It’s time Dr Leaf stopped spreading needless fear about these medications. They help more people than they harm, people who already suffer from the stigma of having a severe mental illness. They don’t need any more suffering stemming from Dr Leaf’s so-called “expertise”. This entry was posted in Biological, Caroline Leaf, Psychological and tagged antipsychotics, cognitive neuroscientist, criticism, dr caroline leaf, infant, neurobiology, New York Times, psychoactive substances by cedwardpitt. Bookmark the permalink. I was just reading Dr leafs blog on the ‘chemical imbalance myth’ and came across this nugget.